Every third weekend in March Rolling Hills Ministries provides Louisiana Baptist Disaster Relief Training. Louisiana Baptist Disaster Relief volunteer leaders from around the state come to Temple Baptist Church in Ruston to lead the training. Disaster Relief Training also happens across North Louisiana as needed. All members of Southern Baptist Churches are encouraged to take part of this amazing ministry. Located at Temple Baptist Church in Ruston. Located at Summer Grove Baptist Church in Shreveport. In 1998 Rolling Hills became the disaster relief coordinating agency for the Louisiana Baptist Convention in North Central Louisiana. This work is done in cooperation with the North American Mission Board. Since that time, the ministry has trained over 1,000 disaster relief volunteers. Rolling Hills Ministries has several units in its disaster fleet including a mobile feeding unit that can produce 25,000 meals per day. 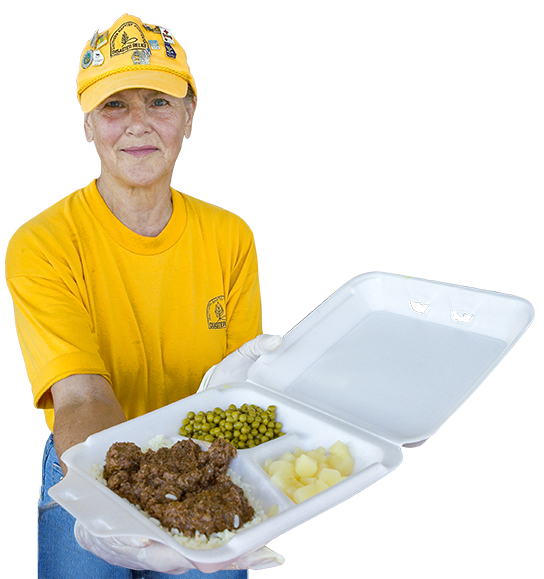 In 2002, volunteers with the Rolling Hills’ Feeding Unit responded to Houma, LA and produced 101,000 meals. After September 11, 2001 Rolling Hills sent five teams to work in New York City. In 2004, Rolling Hills’ Feeding Unit was activated to Alabama and Florida. During that activation over 75,000 meals were prepared. As a result of Hurricanes Katrina and Rita in 2005 more than 226,000 meals were produced on the Rolling Hills Unit. We were activated to Lafayette and Sulfur following Hurricanes Gustav and Ike. During this six week activation over 95,000 meals were produced. In 2009 the ministry added two more units to its disaster fleet including a 40 KW Generator and a shower trailer. View our gallery of disaster relief images and see how your gifts and contributions have helped make a difference in lives who have been affected by unforseen events. Rolling Hills Ministries is committed to making a difference in the world one person at a time by coordinating disaster relief, compassion serivces, international missions, recreational support, and thrift store ministries.